As a “sleeve,” the Gaunlet 2.0 Pro has no carry handles and no “D” rings to attach a shoulder strap (The new Thule Gauntlet 15″ MacBook Pro Attaché does however if that’s a deal breaker for you.) Therefore you should anticipate carrying it in a larger bag such as a messenger bag or backpack. Since the case is very slim, it should fit into most bags without a problem.It may however make pulling your laptop out of your bag a bit more cumbersome unless your bag has a wide opening. Since I use a Waterfield Cargo messenger bag or my Greenroom136 JunkMonkey messenger bag alternately, I have not had any problems at all carrying it and the added weight is negligible. Thule includes an inner velcro strap to help secure the laptop within the sleeve but since I always leave my computer on and ready for use, I dislike using the strap that way and it usually just sits under the laptop when not being used to secure manila folders, magazines or papers when traveling. This brings up a slight issue I have with this case/sleeve. Since I like keeping the sleeve “always-on,” I noticed that the sides of the clamshell case are too tall to allow the magnetic power cord to attach or the USB or earphone slots to be used without propping up the laptop by shoving something underneath it a quarter of an inch or so. 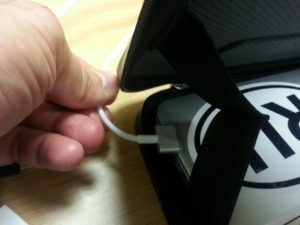 When traveling, magazines or other work materials do the job nicely by raising the computer high enough that the very rigid sides of the sleeve do not block the ports. The zippers, the materials, the flap of materials that cover (and protect) the zippers, and the velcro straps which hold the top of the case upright when using the laptop in the sleeve are all made of quality materials and work well/make me happy. The lining of the case is some sort of soft patterned microfiber. The zipper pulls are covered against scratches and feature a loop so that they are securable, however as the materials is a type of plastic, I imagine it can easily be cut with scissors even when the pulls are locked shut. Lastly, there are no pockets and little storage in the sleeve itself. 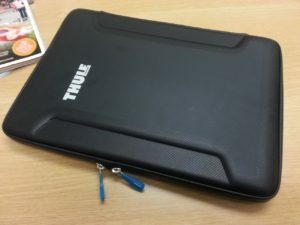 While I could fit my 15″ Retina Mac with the Spec case (below) snapped on inside of the Thule, there is not much room for anything else (maybe two magazines, or one slim notebook drive and a cable). Care should be taken so that nothing inside the case rubs or puts uneven pressure on your laptop. Note the height of the sides of the clamshell which block the ports. A nice case for travel protection that opens easily for the TSA or for work without removing from the sleeve. Good for planes and for working in tight quarters on your lap. The case keeps otherwise hot laptops off of your legs and looks very tough/”man-ly” while doing so. While I didn’t do any “drop-tests” or impact tests with my laptop enclosed, the protection on the sides and top/bottom seems ample enough. There is no foam cushioning or pockets in this slimcase and no handles or straps to carry it by. It is truly a laptop “sleeve,” so it will need to be carried in a larger bag, but it is pretty slim and it should fit in most messenger bags or backpacks. 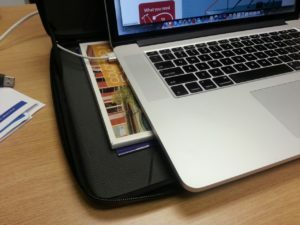 The inner velcro strap can be used to further secure your laptop or as an organizer-type “pocket” to hold magazines, papers or manila folders securely. This also boosts the Macbook Pro so that a charger can be plugged in or headphones, USB 3.0 slot or SD Card slot. Along with the Speck snap-on “See-thru” hard case (http://www.speckproducts.com/seethru-satin-for-macbook-air.html) (which also fits inside the THULE Gauntlet 2.0), one of the better sleeves or “Always-On” cases you can buy. For $50.00, it seems a little pricey to me, but as the Spec cases run approx. $50. as well, I guess that’s the price of protection these days.